The e-book marches on. Say what you want about devices, prices and platforms. Formats and nostalgia. But the electronic book is convincing even the most ardent sceptics. On Tuesday, publishers Simon & Schuster released the electronic edition of Ray Bradbury’s classic, Fahrenheit 451. The e-book, launched by all major digital book retailers, is priced at $9.99. The release is ironic at many levels. 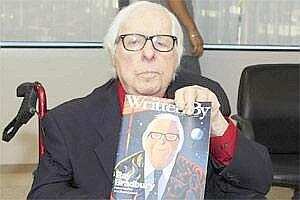 First of all, Ray Bradbury has always been a staunch advocate of paper books. Indeed Fahrenheit 451 is a novel about a dystopian future where books are banned and firemen set heaps of them alight. The book is named after the temperature at which paper burns. Many news stories about the e-book quote Bradbury as once having said that e-books “smell like burned fuel". Latest news indicates that sales of e-book readers are robust. On Monday, Amazon’s stock rose 6.2% after the company said that sales of its flagship Kindle devices were surging through the traditional US and European holiday season. One Citibank analyst estimates that Amazon will sell five million Kindle Fire tablets in the last quarter of this financial year. That is excluding the other Kindle devices. The same analyst expects 20 million Kindle Fires sold by 2013. While the numbers are great news for Jeff Bezos and Amazon, it poses both a threat and an opportunity for authors and publishers. Irrespective of their own individual feelings about the sanctity of paper texts, the market for digital editions is now simply too big to ignore. One study by IDC put the global sales of e-book readers, by the end of 2010, at around 13 million, Kindles accounting for around half of them. These are just too many readers, with open wallets, for anyone to ignore. Simon & Schuster informs that it is looking to eventually release digital editions of all of Bradbury’s books. Millions of readers will soon be reading Fahrenheit 451 on their Kindle Fire. What delicious irony.